Every single one of us has been touched in some way by mental health issues such as anxiety and depression. Maybe a close friend, a relative or even ourselves have been affected. 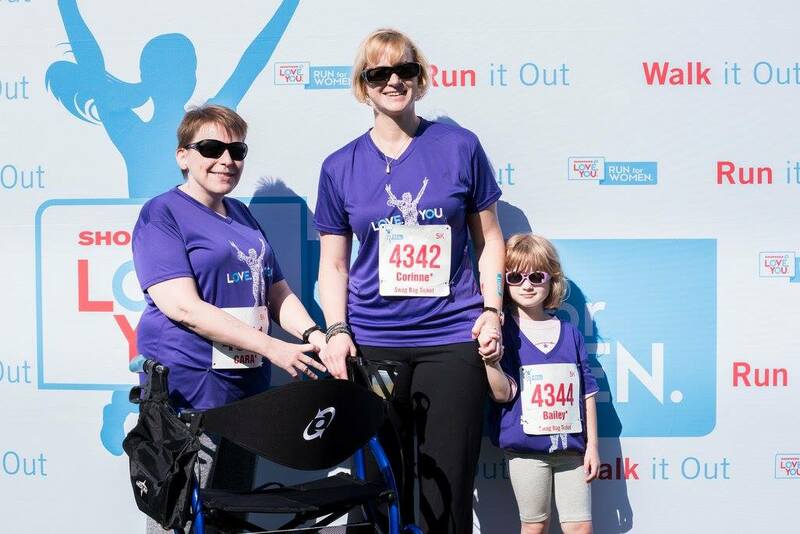 It is important to understand that we are not alone, and these disorders are more common than you think. #BellLetsTalk day is an annual event that encourages all Canadians to talk about mental health, work towards ending stigma and support mental health initiatives across the country. 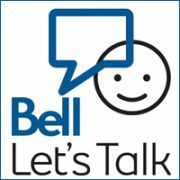 For every text, message, wireless and long distance call by Bell customers, every tweet using #BellLetsTalk, every Facebook share of the Bell Let’s Talk Day images or videos and every snapchat geofilter used Bell will donate 5¢ to support Canadian mental health programs. Counselling supports you to resolve many different kinds of challenges. It can equip you with tools for change, help you heal and prepare you to move forward. We have counsellors who can help with a wide range of issues that you may be facing as an individual or in your family and intimate relationships. 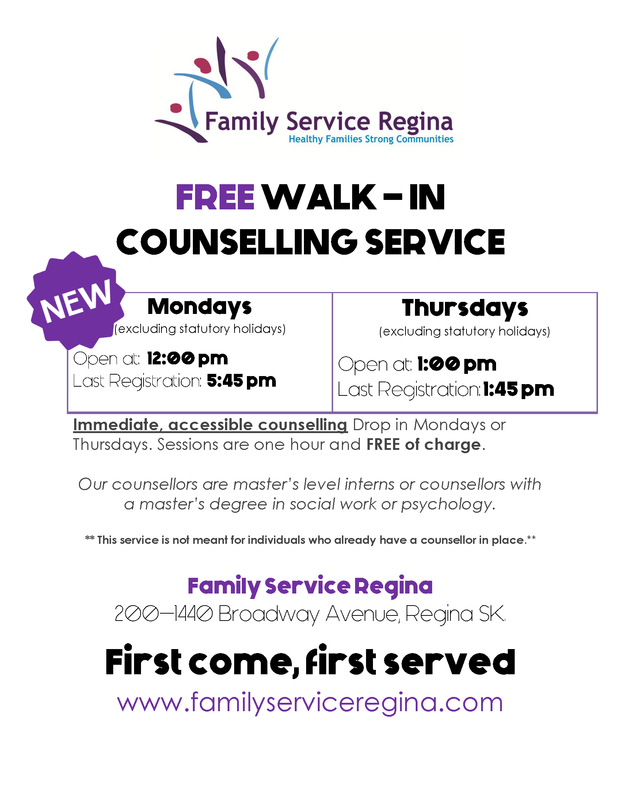 Contact Family Service Regina at 306-757-6675. Ask to speak with the Intake Counsellor, who will ask you some questions about yourself and your situation and guide you through the process. 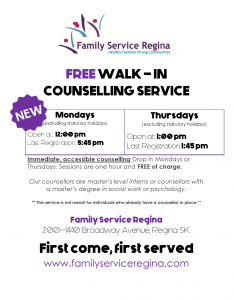 Walk-in counselling is FREE and roughly a 60-minute session, we run Walk-in Counselling every Monday 12:00pm – 6:00pm and Thursday 1:00pm – 3:00pm (excluding statutory holidays.) You will be seen on a first come, first served basis. Please arrive at least 1¼ hours before closing if you wish to be seen. Our last session starts one hour before closing. Negative self-talk is a huge problem for people of all ages. This thinking often begins in childhood. Children are receiving constant messages that they are not good enough. Many children get “stuck” in thinking this way from hearing negative messages about themselves and their abilities. They then repeat these messages to themselves over and over. Repetitive negative thinking about yourself, others and the world can lead to future mental health struggles. So we’ve comprised 5 tips on how to improve your child’s emotional well-being. STOP and really listen to your child before reacting and offering advice or getting angry. When children are upset, be careful to understand their point of view and validate how their feeling whether or not you agree. Listening to your child’s viewpoint can reduce their defensive reactions. This enables them to express what happened, or what their thought process was, so they can grow. 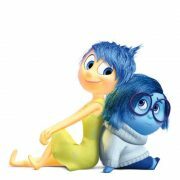 Many children shut down when they are upset because they think negative feelings are bad and shameful. When you invite your children to explore and express their feelings, it shows them that difficult feelings are normal and healthy and the end result is their development of emotional intelligence and good social skills. By equipping them to recognize and deal with what they are feeling; they are increasing their self-esteem and are able to build stronger friendships too. Children often show that they are struggling, through their behavior. If your child is acting out and getting into trouble It’s a signal that there is a bigger issue to be addressed or that they are in need emotional support. All children need guidance and support to help them discover their emotions and create healthy relationships. Teach your child that every single person on the planet will experience times of happiness and times of despair. There is no shame in having a hard time. Often parents tend to focus too much on the struggles their children are having, be it in a sport or what they’re getting “stuck” on in school, this causes children to think they aren’t good enough. We need to encourage our children to balance the amount of time they focus on the negative and what their good qualities and natural skills are. Counselling and leisure activities are great ways of helping your children build the skills they need to be the best version of themselves. Taking your children to counselling to learn new coping skills in an area that may be difficult for them can be a big help to their emotional health and development. 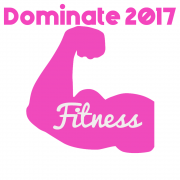 It makes them healthier, stronger and more confident individuals. Many adults grew up ashamed of their feelings and unfortunately, we pass this onto our kids unintentionally. Children are like mirrors that reflect back to us what they see in their environment (monkey see, monkey do!). 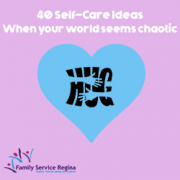 You can teach your kids emotional intelligence by showing them that you aren’t afraid to express your own feelings and cope with them in a healthy way. Example: If you lose your temper, first apologize; next, show your kids how to learn from the experience by making emotionally healthy choices yourself. Teach them, by setting the example of taking responsibility for your actions. Show them it is normal to make a mistake. Our brains are designed to change when we repeat thoughts and actions over and over. Picture yourself and your child making a snow angel, slowly, the repetitive movements groove into the snow deeper and deeper to make a beautiful angel shape. Our brains work in a similar way. If your child is rehearsing negative thoughts, they may become very good at something that is detrimental to their well-being. To change negative thinking patterns takes practice, try encouraging them to focus on the good things instead. They will eventually automatically gravitate towards positive thinking and start to feel happier. We’ve all felt shame. It’s that feeling when you want to tuck yourself into a tight little ball, pull the blanket over your head and just disappear. You are a bad person who is unworthy and unlovable. Not surprisingly, shame is rooted within in our family. As a result of not feeling seen, loved, valued and understood, we developed the belief that we were not being loved because there was something wrong with us. Children develop their identity based on their parents reactions to them, if you grew up in a neglectful, abusive, controlling or otherwise dysfunctional family, then shame is an inevitable consequence of those painful experiences. How could you not feel shame if you were mistreated or ignored by the very people who were supposed to protect and care for you? Something must be wrong with you if your parent(s) can’t show you love. When we are made to feel inadequate and unlovable, we begin to see ourselves that way. How we’re treated by others when we were children becomes the way we internally treat ourselves. The experiences which we were shamed as children become the unconscious triggers for feeling and expressing shame as adults. If you were a little boy shamed for being sensitive or crying, then you’ll feel deeply embarrassed or even humiliated when you cry as an adult. Thus propelling you to do everything in your power to repress feelings that might make you cry. We develop multiple unhealthy coping mechanisms to hide our feelings of shame, all which have a negative impact on our most intimate relationships. Control, blame, anger, withdrawal, perfectionism and people pleasing are all strategies that temporarily relieve the feelings of inadequacy and unlovability. Step off the shame cycle by practicing these strategies and working toward healing. As painful as this might be, it’s important to understand that shame is not your fault. You are an adult, with an adult perspective and judgment. Take a look at the small, innocent child you were and how you were incapable of understanding and processing the hurtful behaviors of your parents. You desperately needed their approval and unconditional love, and if that wasn’t available to you, you grew to feel unworthy of anyone’s acceptance and love. This was NOT your fault. Remind yourself of this whenever you feel your shame triggered. Pay attention to what triggers your feelings of shame. This may be difficult at first, as we often bury our feelings under layers of unhealthy coping mechanisms. So start with the behaviors, the way you react to the feeling, and then ask yourself what happened to make you react. Did someone say something that made you feel vulnerable? We’re you rejected in some way that reminded you of your childhood? Once you know what trips you up and envelopes you in feelings of shame, you can begin to learn healthier responses. When you feel shame, it can be difficult to be kind and loving toward yourself, but try talking to yourself and treating yourself with the same loving-kindness you’d show to a child or a good friend until you begin to change your thoughts and feelings about yourself. Based on groundbreaking research by Kristin Neff, it’s been discovered that self-compassion can act as an antidote to the self-criticism that comes with shame. The three key components of self-compassion are self-kindness, a sense of common humanity, and balanced mindful awareness. Kindness opens our hearts to suffering, so we can give ourselves what we need. Common humanity opens us to others so that we know we aren’t alone. Mindfulness opens us to the present moment, so we can accept our experience with greater ease. Together they comprise a state of warm, connected, presence during difficult moments in our lives. Rather than believing every thought that flows through your mind, find evidence to the contrary. Part of you knows you aren’t a bad, unlovable, unworthy person and that your thoughts aren’t the entire truth. Your job is to weaken the grasp shame has on you and you can do that by challenging your thoughts when they try to control your mind. Put up a mental fight by reframing your thoughts and focusing on the positive. 5. Accept love and kindness. The feelings of unworthiness attached to shame make it very difficult to accept love from others. In fact, you might even distrust people who are kind to you because they can’t discern that you are really “bad” and unworthy. This is a dysfunctional reaction to loving behavior from others, but you have to be open to teaching yourself a new way of responding. Accept compliments without diminishing or deflecting them. Allow yourself to trust the judgment of the person who sees the good in you. This will take practice, but over time it will feel more natural to relish in the love and appreciation from others. Finally, you may need the support of a professional counsellor if your shameful feelings are debilitating. If so, don’t hesitate to contact us. Working with a counsellor is positive step that puts you back in control of your future happiness and well-being. To get started, buy yourself a pretty notebook and write down the steps below. This way, you’re able to hold yourself accountable. Your experiences from 2016 can help you create an amazing 2017, but you have to be willing to evaluate your experiences and work on your own personal development. To evaluate your last year, grab a calendar, pull one up on the internet or on your cell phone and analyze how you spent your time each month, week, day. Now, for each category, ask yourself the following two questions. What positives did you accomplish in this category? What are some things in this category that disappointed you? Make a header for each category and write down your answers. Once you’ve taken inventory from the last year, it’s time to move on to step two. What are your deepest desires? How do you want to be remembered? Write down any dreams or visions you have for your life. Writing down the vision you have for your life gives you a sense of direction and you’ll begin to live life with intention. The clearer you are about what you want, the more likely it is that you will live a fulfilling life. To set goals, use the SMART method. Write down realistic goals and give them a deadline, deadlines will hold you accountable. Save $3,000 for a year-end vacation by January 1, 2018 by putting $250/ month into a savings account. You want to set goals that push you outside of your comfort zone, but not so far that they’re unattainable. You need to know why you want what you want, without it, it won’t be possible for you to accomplish your goals because your reason won’t be strong enough. Think about all of the things you listed above that you want to do with your life and ask yourself why. Tammy has to work for herself, her reason isn’t because she wants financial freedom or to build a business for her family. Her Reason is because she relied on someone to provide for her and when the relationship ended she was left with nothing. Now, she can’t work for other people because she has to be in financial control. Realising this makes her focus and commitment greater. Knowing your reasons propel you forward, they keep you going when things get tough. Finally, you need to set these wheels in motion! Use your digital calendar in your cell phone and put in your deadlines for goal accomplishment, also use monthly check-ins to reflect and revise your plans based on your progess. Living intentionally and designing your life isn’t limited to the beginning of a new year. YOU are in control of your own destiny. 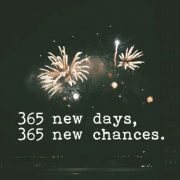 Cheers to making 2017 your best year ever! https://familyserviceregina.com/wp-content/uploads/2016/12/173c4e2a9170d4ba858092a41683eb61.jpg 630 415 Carissa Trenton https://familyserviceregina.com/wp-content/uploads/2016/03/Family-Service-Regina-Logo.png Carissa Trenton2017-01-01 07:00:062016-12-21 17:49:04Make 2017 Your Best Year!